Grade: Good VF, a few minor marks. 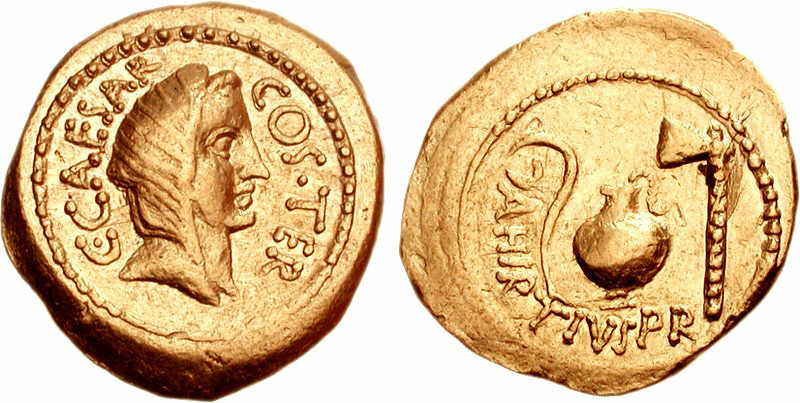 Notes: Aulus Hirtius, praetor at the time this coin was struck, was a close friend of both Cicero and Caesar, and had served as the latter's legate in Gaul. He was consul in 43 BC, having been nominated by Caesar, and was sent along with Octavian and Pansa against Antony, who was besieging Decimus Brutus at Mutina. Hirtius defeated Antony but fell while leading the assault on his camp. Hirtius is credited with completing Caesar's commentaries on the Gallic, Alexandrine, African, and Spanish Wars.